Shop George Nelson Lighting and Furniture. George Nelson was one of the most prolific architects & designers of the 20th century. Perhaps most famous for the George Nelson Bubble Lamp® collection which encompasses iconic pieces such as the Saucer-, Ball- and Pear Bubble Lights. Stardust is the leading source for George Nelson designer lamps made in the USA and offers the largest collection of Nelson's Pendant Lighting in stock and ready to ship. George Nelson (1908-1986) was a pioneering modernist who ranks with Raymond Loewy, Charles and Ray Eames, and Eliot Noyes as one of America's outstanding designers. Nelson's office produced some of the twentieth century's canonical pieces of industrial design, many of which are still in production: the ball clock, the bubble lamp, the sling sofa. Nelson also made major contributions to the storage wall, the shopping mall, the multi-media presentation, and the open-plan office system. The author of this definitive biography was given access to Nelson's office archives and personal papers. He also interviewed more than 70 of Nelson's friends, colleagues, employees, and clients (including the late D. J. De Pree, former head of the Herman Miller Furniture Company and Nelson's chief patron) and obtained many previously unpublished images from corporate and private archives.The full range of Nelson's work is represented, from product and furniture design to packaging and graphics to large-scale projects such as the Fairchild house and the 1959 American National Exhibition in Moscow. Because Nelson was a serious and original thinker about design issues. George Nelson Designer & Nelson Objects and Furniture Design. George Nelson (1908-1986) was one of the most prolific American industrial designers, and one of the founders of American modernism. 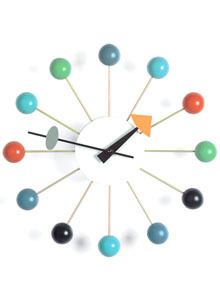 His iconic wall clocks such as the Ball Clock, Sunburst Clock and Sunflower Clock are widely recognized for their atomic midcentury modern style. Equally attractive are Nelson's Bubble Lights such as the Ball Lamp and Saucer Light: all these designs of George Nelson have come to define the mid-century modern aesthetic. Shop the best selection of George Nelson design at Stardust, home of the largest collection of modern design lighting and furniture online. Enjoy a 110% Low Price Match Guarantee on every Nelson Lamp, Free Shipping and Friendly Service from our Knowledgeable lighting experts! View George Nelson's lighting collection at our showroom or purchase online from Stardust.com.